The Iowa State Fair is an annual August tradition in the central U.S. state. It is a chance to showcase Iowa’s agricultural products and traditions in a distinctly American atmosphere. It is also the closest many voters can get to candidates on the campaign trail. Reaching out to voters at the state fair is a rite of passage for candidates hoping to do well in the Iowa Straw Poll. Since the first Iowa Straw Poll - held in Ames in 1979 - the Iowa State Fair in the capitol Des Moines, with it’s carnival rides and wide variety of fried food booths, has been a critical campaign stop for candidates hoping to emerge as the frontrunner. “It’s probably easier to have access to candidates here in Des Moines Iowa than it is in New York City or Washington D.C. It’s an amazing place,” said Des Moines native Marc Daniels. He has watched his relatively small Midwestern state evolve into a major political testing ground that can now make or break a Presidential candidate’s national campaign. ”Candidates get an opportunity to fine tune their message, and to sharpen it. They get an opportunity to find out whether what they are talking about is what people want to hear. It gives them an opportunity to practice their rhetoric for later speeches,” said Daniels. 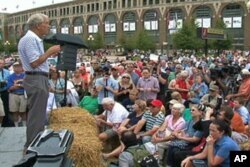 Practicing for those speeches at the fair takes place on a “soapbox,” in this case large bails of hay, surrounded by crowds of interested voters. Often well attended by supporters of the candidate speaking, it is open to everyone. As former Massachusetts Governor Mitt Romney discovered, that includes detractors. “What are you going to do to strengthen Social Security, Medicare, and Medicaid, without cutting benefits?" asked one spectator. “All right, let’s get his answer, let’s get his answer. You’ve had your chance, anything else you want to say?” replied Romney. “I want to see what your gonna say,” said the man. “The way this is going to work is you got to give your question, and now I’m going to give my answer. And if you don’t like my answer, you can vote for someone else. But now it’s my turn to give my answer. You ready for my answer? I’m not going to raise taxes! That’s my answer! I’m not going to raise taxes!” said Romney. The Iowa State Fair has a family atmosphere, and many candidates attend with their loved ones in tow. Linda Paul is hundreds of miles away from her home state of Texas. Even though it’s her first trip to the fair, she said it is somewhat familiar. “This is my first time in Iowa. A lot of corn was my first impression. The state fair honestly reminds me a little bit of home with our state fairs and everything,” she said. Paul is at the fair to help her grandfather, Texas Congressman and presidential candidate Ron Paul, get the votes he needs to do well in the Straw Poll. “It’s very important for him to come out, talk to his supporters, talk to some that are undecided. Tell them his message. He won’t tell them something to win his vote. He’s going to tell them the truth and what he truly believes in,” she said. That message resonates with Benjamin Adair, who came to show his support for Ron Paul. He said campaigns like Paul’s tend to get more traction in Iowa because of its size. “If you’re a smaller candidate that doesn’t have as much money, I think Iowa is a good place. It’s cheaper to buy ads, easier to travel across and talk to people,” said Adair. Adair said regardless of who wins the Straw Poll on August 13, he believes Ron Paul’s campaign will benefit from the time he has invested campaigning here.